1 of 1 Drain and rinse 2 cans (15 ounces each) chickpeas. Combine with 3 tbsp each olive oil and raspberry balsamic vinegar, 2 tbsp mayonnaise, 1/2 tsp fresh chopped thyme and 1/8 tsp each salt and pepper. 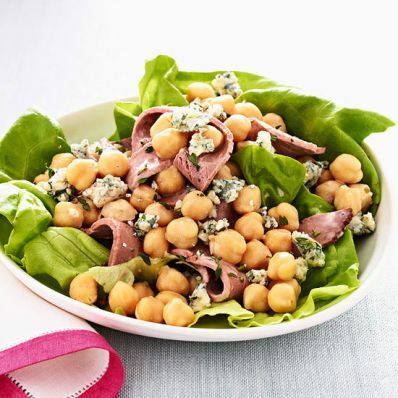 Serve in Bibb lettuce cups with 1/2 pound roast beef, sliced into ribbons. Top each serving with 2 tbsp crumbled blue cheese.